Jointed vacation home. The house is part of a private estate, which offers several facilities within walking distance. Such as a large swimming pool with sunny terrace, a poolhouse, and a tennis court. In the house, two rackets are available for use, so nothing is holding you back from making your first serve. This attractive vacation home has a matelpiece and wood beam ceilings, the interior design is quite charming, however, you might want to spend more time in the south part of the garden or on a shaded lounge chair with a phenomenal oceanview. The stunning sight of the rough, red, and rocky coast is so striking, you'll be unable to forget it. The home lies near the coastal town of Anthéor (200 m). Here you'll find a number of beautifully located (pebble)beaches with views of the Iles des Vieilles. In Agay (1 km), pleasant beaches of both sand and pebble line the edge of a bay. Agay is also an excellent place to take a stroll through the Estérel Massif or make a bike trip along the recently paved cycle path. 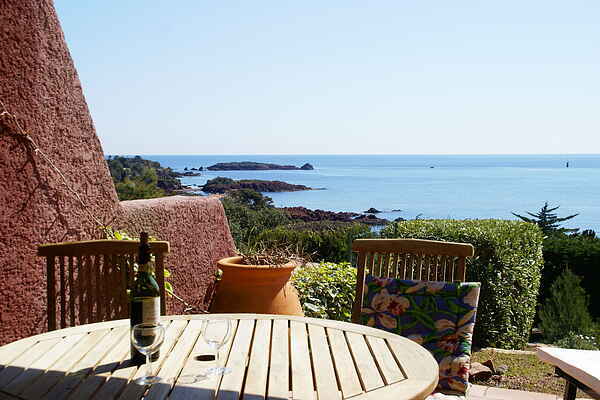 In Anthéor, the beautiful road rises along red rocks and overgrown ravines ending at Pic du Cap Roux, the top of which (452 m) offers a dazzling view of the Corniche de l'Estérel.